Macarons are certainly a popular dessert, but be assured – these aren’t your average icing-filled meringue biscuits! We’ve actually rounded-up 40 of the most amazing novelty macaron recipes that you can make yourself. From popular cartoon characters and unique food combinations, to cute animals and nature-inspired macarons – There’s certainly something here for everyone! Have you ever had a dessert dilemma where you can’t decide between making delicious donuts or mouth-watering macarons? Adventures in Fashion has the answer! Check out her DIY donut macarons. Fancy eating some lunch-inspired macarons for dessert? You won’t want to miss this incredible tutorial from Alana Jones-Mann. Aren’t these DIY colored splatter macarons beautiful? Not only do they look great, but they also taste delicious too! A Side of Sweet will show you how to create them. How wonderful do these cake batter macarons look? Bakers Royale has a fantastic tutorial to show you how you can make these too! These fancy little pineapple macarons are adorable, aren’t they? Brite and Bubbly is the talented blogger behind this DIY tutorial. Here’s a stripped-back version of the previous tutorial by Brite and Bubbly, so if you wish to make some cute pineapple macarons minus the faces, then this is the DIY project for you! Who wouldn’t love these DIY bumble bee macarons by Cake Crumbs? Their colors are striking too! Your sweetheart is going to love these heart-shaped macarons from Delectable Deliciousness! Aren’t they gorgeous? We have a feeling that they taste scrumptious too. These DIY gingerbread macarons from Fix Feast Flair are incredibly unique, don’t you think? They’d be extremely popular at a child’s party too, so be sure to check out the tutorial. Here’s a very creative idea for St. Patrick’s Day that everyone is sure to love. Simply decorate your macaron in green sprinkles and candy shamrocks, just as Get Creative Juice has done – Beautiful! Want a Halloween treat that won’t scare away your guests? Get Creative Juice has created these DIY pumpkin macarons that will taste delicious too. Here’s a great idea for Christmas macarons which won’t take hours and hours to make. Holi Coffee has created these Santa-inspired sweets to add a festive cheer to anyone’s day. I Heart Baking loves Hello Kitty and has created these simple DIY macarons celebrating the popular character. You’ll love her tutorial too! The wonderful tutorial to help you create these DIY Halloween inspired macarons can be found on Lauren Conrad’s blog. They’re simple to make, plus children and adults alike will love them. These Valentine’s Day macarons from Miss Renaissance are sure to turn heads with their brilliant and eye-catching designs. The best part is that they’re really simple to create, thanks to this DIY tutorial. If you’re thinking of throwing a sports-themed party any time soon, you might want to check out these DIY sport ball macarons from Paint the Gown Red. Trust us, your loved ones will thank you for it. Passion for Baking UK has created some adorable macarons which look like koalas – isn’t that wonderful? We especially love how you can use candy stars for their ears. If you’re a fan of candy corn, then you’re going to love these DIY candy corn macarons from Persia Lou! The color scheme will fit right in at your Halloween party. Add a fancy swirl to your next batch of macarons, just as Persia Lou has done! Their peppermint flavor will be a crowd pleaser too. Here’s an Easter macaron alternative that children are sure to love! Project Denneler has created these fun carrot-shaped macarons for that bunny-loving twist. Penguins are a fascinating animal and certainly one that is much-loved by children. Raspberri Cupcakes has created a DIY penguin macaron recipe that will delight you! 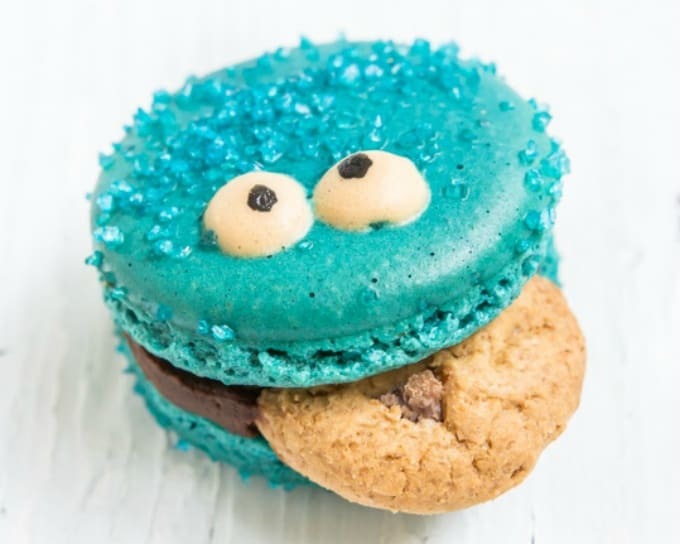 C is for cookie, as is crumbly, creative, and cool – words which can describe this DIY Cookie Monster macaron tutorial from Raspberri Cupcakes! These emoji macarons from Studio DIY will add a whole lot of fun to any occasion! You’ll love this clever idea and informative tutorial. These DIY fruit macarons will almost trick you into thinking that these macarons are healthy! No to worry though, as they certainly are scrumptious. Sugar and Cloth has this wonderful tutorial. Celebrate the beginning of spring with some beautiful macarons, such as these DIY daisy macarons from Sugar and Cloth! They’re the perfect thing to devour this weekend. Here’s a twist on two sweet treat favorites! These DIY candied apple macarons from Sugar and Cloth are way better than an original candied apple, dare we say? Cacti are all the rage now, so why not serve-up some awesome cacti macarons at your next gathering, just as Sugar and Cloth has done? Serve them in miniature terracotta pots for something totally unique! We all scream for ice scream, but now you’ll be screaming for ice cream macarons too, thanks to this DIY tutorial from Sugar and Cloth. She’s certainly the novelty macaron expert! The marbled look is another trend to grace our radar of late, so these marbled macarons from Sugar and Cloth are sure to be hugely popular. The colors really pop! 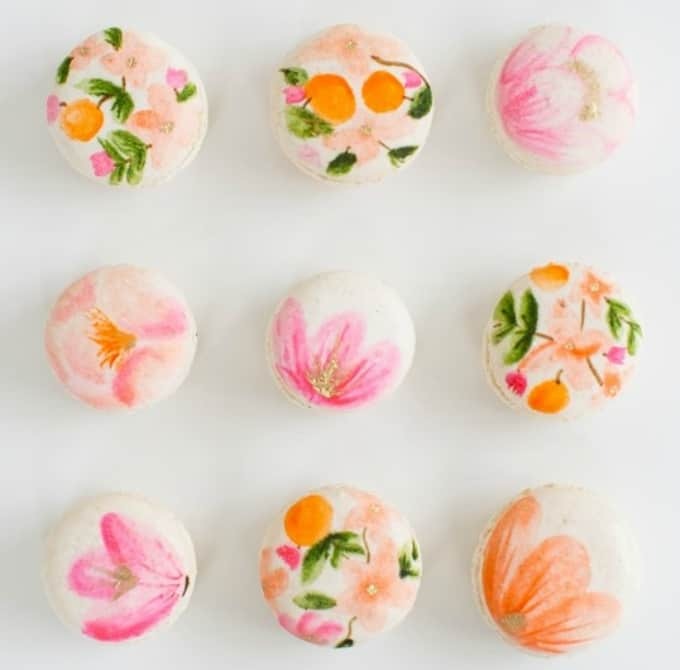 Quite possibly our favorite DIY macaron design of all, these stunning floral macarons are almost too pretty to eat! The talented Sugar and Cloth will show you how they’re made. Brunch macarons? Count us in! Some may say that brunch is the best meal of the day, but we maintain that these delicious macarons from Sugar and Cloth are even better. If you want a special treat to spoil a loved one with, these DIY conversation heart macarons from Sugar and Cloth are for you! With a gorgeous heart shape, pastel colors, and gold lettering, it just doesn’t get much better than this. When we told you that Sugar and Cloth was the novelty macaron expert, we weren’t lying – just take a look at these beautiful flamingo macarons! Want to create some yourself? Be sure to check out the tutorial! The idea of DIY mini donut macaroons is so good that even The House that Lars Built has created her own version of them! Which version will you choose to create? Here’s another beautiful springtime treat, this time from The Proper Blog. This tutorial actually uses edible flower petals to decorate the macaron – Brilliant! Here’s some more Halloween inspired macarons, but with a twist! The Proper Blog’s version of the novelty macaron is great for beginners as it incorporates multiple, simple designs. These edible macaron Christmas ornaments from The Proper Blog serve two functions. Firstly, they sit on your tree and look beautiful on Christmas morning, then you can unhook them and enjoy the sweet treat. Genius! If you’re a lover of typography and swirly fonts, then you’ll love these DIY macarons from The Proper Blog. This is a quick and easy way to add that novelty element to otherwise plain macarons. Appropriately named ‘funfetti macarons’, these DIY treats from The Simple, Sweet Life are sure to be a winner at any party! We love the generous cream filling too. These DIY snowman macarons from U Try It are the best cure for the winter blues! The best part is that you’ll also have a blast decorating them. Weren’t they all incredible? We’d love to hear which DIY novelty macarons you’ll be wanting to whip-up in the comments section below! Love this! So much inspiration it makes me want to make a batch right now!